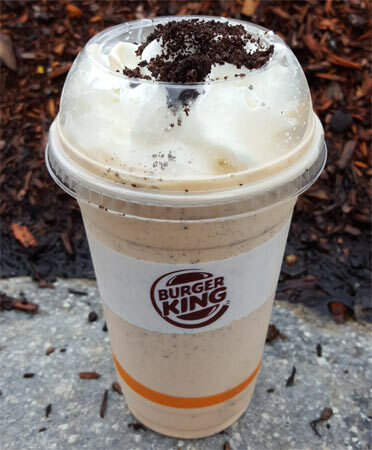 [New for Fall 2015] Or should I say Oreo pumpkin spice shake? Iunno. All I do know is that many of you were angry about the Red Velvet Oreo Shake so let's see if the King can redeem himself a bit. Oh, and no, I didnt get the HA1loween Whopper because I didn't feel like getting 2/3 of my recommended daily sodium intake (Marvo or Ryan didn't seem to like it much anyway). Well, they certainly nailed the presentation. I like the fact the cup even has brown and orange highlights. In fact, I was so busy staring at the shake (and so bored from waiting several minutes for it to be made), that I totally missed the fact that they forgot to hand me a straw. I tried drinking it from the top, but before I make a mess or cut my lip, just give me a sec to run in to McDonald's and steal a straw. Alright, I'm back in action and this shake... is pretty decent actually. They've gone a bit heavy handed with the spices, but not distressingly so. It's not worst of the worst here so that's a positive. I would like a bit more pumpkin flavor and a cut in the spices, and then we'd really be in business. The Oreo bits? Sure, they clog the straw on occasion, and you won't taste them directly, there's no blast of Oreo flavor, but I feel like they are taking the edge off the spice blend, and that's a positive. I know BK is kind of on an Oreo kick right now, and that's fine, but it's a shame we couldn't go graham crumbs instead in hopes of achieving more of a familiar flavor balance... though on the flip side, you want companies to try to be different from the standard fall offerings. So maybe I don't really have a point then. Anyway, so yeah, I enjoyed it. I didn't love it mind you, I'm a bit too much of a purest when it comes to these thin fast food shakes, but I have no problem saying give it a try it it peaks your interest. 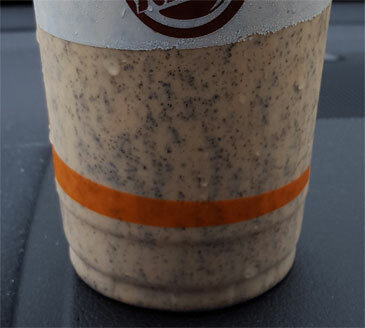 It's definitely way better than their Red Velvet Oreo shake. I think they are being lazy with the new shake creations. "OREO" shakes. Come on. They could had used the pumpkin spice oreos over the original oreos. It would had brought the flavor level way up. Well there is plenty of overall flavor, there's just not a ton of pumpkin flavor to help round things out. It's still respectable though. @J: nothing wrong with enjoying it, it's just that we just had several readers who were having trouble with all the red dye, that's all. It's good, but a little too sweet. Would I order again? No. I'm intrigued. I do wish that all pumpkin flavored desserts would incorporate some kind of graham cracker or pie crust in them. Oreos seems like a hasty, last minute decision.